A few weeks ago I received a copy of Ladybug from Butterflyfish. When I put it in the cd player on the way to preschool/day care one morning, the kids fussed at me. It wasn’t their usual Laurie Berkner that they were used to listening to during the morning ride. Fortunately, it didn’t take long for them to adjust. After just a couple of listens they were singing along! Matthew Myer Boulton, Elizabeth Myer Boulton, and Zoë Krohne formed Butterflyfish after chatting at a picnic about how to explore the spiritual side of life with their children in new ways. Agreeing that most spiritually themed music made for families were “pretty thin broth, both musically and spiritually,” they set out to create what they had been searching for. Their first cd, Ladybug, has gotten great reviews, even being called “Oh Brother, Where Art Thou?” for kids! Ladybug is a great collection of folk/bluegrass style songs with a spiritual message. Mixed in with a collection of Boulton’s originals, are new takes on some of the old classics such as “Jesus Loves Me” and “Deep Down In My Heart.” The music is light-hearted and fun, while also introducing biblical stories and context. My 4-year-old’s favorite song is “What Jonah Learned Inside the Whale,” and I keep catching him singing it even when the cd isn’t on. The best part though, is that it has him asking questions and wanting to know more. After listening to “When the Spirit Sings In Me,” we had a long discussion about what “the Spirit” means and how it relates to our lives. Don’t think this music is only for kids though. I’ll admit to playing it (and singing along) even when I’m in the car by myself! I can’t resist the harmony on “Music.” Even my husband, who is not at all fond of Folk music, likes it and it’s rare that he’ll admit to liking anything that isn’t hard rock or metal. For my family, this cd came at a perfect time. We’ve been trying to re-commit ourselves to going to church and just started attending a brand new church in our area. I love that the music is helping my son become more interested in God and to be quite honest, it really puts me in the mood to worship on Sunday mornings! I was actually quite surprised at how much my family loves this cd. We have all been singing the songs for a couple of weeks now and haven’t tired of it yet. Because we love it so much, I e-mailed Elizabeth and asked if she would be willing to provide another copy of Ladybug for me to give away to my readers. She graciously said yes! All you have to do to enter the contest is leave a comment below. I’d love it if you would tell me what your favorite song (spiritual or otherwise) was when you were a kid. Are there memories attached to it or did you just like the song? Contest will close Tuesday, December 15th, 2009, at 11:59 p.m. CST. One winner will be chosen from all eligible comments via random.org and notified by e-mail. 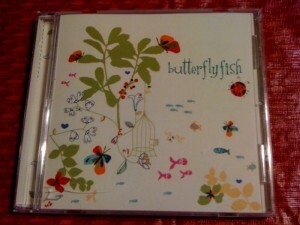 To find out more about Butterflyfish, go to www.butterflyfishband.com. You can sample and purchase Ladybug in the store, or check out some of the other fun stuff, such as the yummy Strawberry Lemonade recipe! Disclosure: I received a copy of Butterflyfish’s cd, Ladybug, for the purposes of this review.